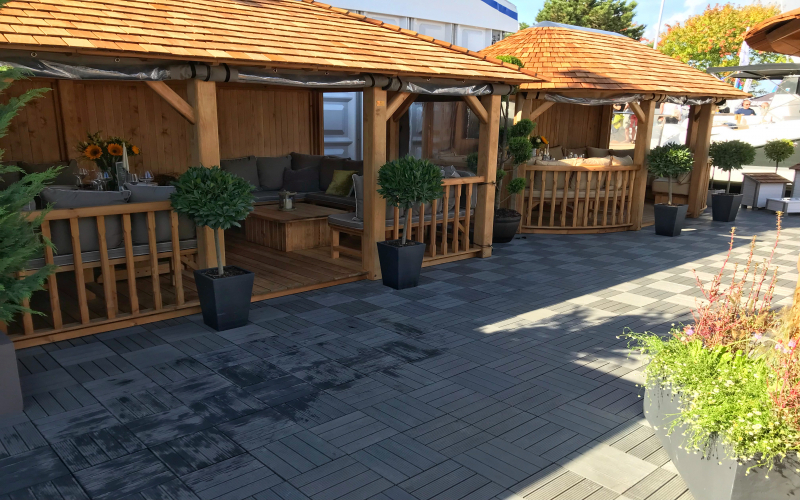 AB Composite Decking Tiles - In use at the 2018 Southamption Boatshow by Crown Pavilions. Creating a hardwearing, attractive, quick and cost effective exhibition stand. Over the years AB's customers have utilised our composite decking and decking tiles in many ways. With a 20 year warranty you can be sure that no matter what you build, your project will stay looking great for years. Just one of the creative ideas which AB Composite decking Tiles have been used for is shown in the photo above. Crown Pavilions are a long term customer and partner of AB Building Products. For this years 2018 Southamption Boat Show, they built a very substantial and beautiful stand showcasing their wonderfully crafted wooden garden buildings. They choose to use AB Composite Decking tiles as a great contrast to their natural wood constructed buildings. The whole stand needed to be build quickly, then withstand 10 days of thousands of feet and the UK weather, but remain solid, safe, slip free and appealing to prospective customers, I think you can agree it's done the job very well. If you would like to talk to us about your composite decking tile project please get in contact. Whether it's a small back garden of hundreds of square meters for a show, exhibition or hotel, AB can supply!